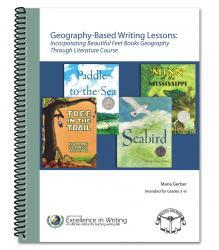 Geography-Based Writing Lessons: Incorporating Beautiful Feet Books’ Geography Through Literature Course teaches writing by utilizing the Holling C. Holling classic books and complementing Beautiful Feet Books’ GeographyThrough Literature course. These lessons, which are geared toward emerging writers in the elementary grades, are designed to follow the classical system taught by the Institute for Excellence in Writing. The guide recommends that parents are familiar with the Institute for Excellence in Writing’s method through previous training. But parents who have previous language arts and writing knowledge will be able to use this guide on its own. A free download of the Student Resource Notebook is included with the purchase of this guide. Combined with the instructions in Geography-Based Writing Lessons, I find the lessons easy to understand and implement. For younger students, parents can be more hands-on and help them with their outlines and writing, even serving as their “secretary” as they dictate their essays. Older students can work more independently. This course is very easy to adapt for different ages, and homeschool parents will find it easy to modify for use with multiple children at once. You are even given permission to skip, pick, and choose which lessons you would like to complete, with the exception of the research report and formal essay units using Minn of the Mississippi. The Holling C. Holling books provide beautiful examples of descriptive writing. My kids and I could hardly wait to follow Paddle’s journey to the sea or find out who was passing the tree in the trail next. The unique lessons will inspire students, improve their communication skills, and help develop their appreciation for the written word. The flexible structure of Geography-Based Writing Lessons will allow parents to incorporate writing easily and enjoy spending quality time together as a family.